Throughout his tenure at SUNY New Paltz, Cardillo has worked with students on numerous large-scale projects, including a recently completed outdoor wall mural called Environment and Culture: From the Amazon to the Hudson River Valley. 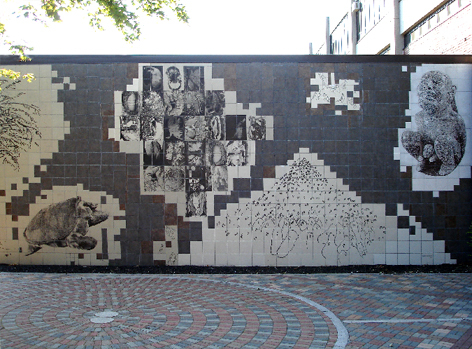 Constructed of porcelain tiles printed with iconic images from Cardillo's oeuvre, this monumental work is permanently installed on an exterior wall of the Humanities Building along the campus concourse. This major work illustrates Cardillo's blending of two realities - his Latin American roots and his adopted home in the United States. The artist's interestes in the preservation of the virgin forests of the Amazonian basin parallel and compliment his deep commitments to sustaining the remaining wilderness habitats within the Hudson Valley region.